The EP310 is a small, low cost, general purpose data collection peripheral device that communicates with a software application program over a TCP/IP network. 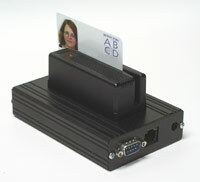 It can decode input from a bar-code, mag-stripe or Wiegand card reader and convert it to an ASCII string. 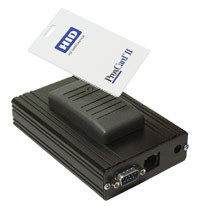 A serial RS-232 port allows communications with a serial device (scanner, scale, counter, etc.) over the network. In addition, digital I/O interface options include up to four (4) relay outputs and four (4) digital inputs with counters. The network interface supports both 10BaseT and 100BaseT Ethernet connections. Optional 802.11b/g wireless connectivity is also available. When the EP310 is connected to an Ethernet network it sends data to and receives commands from a user program. Reader input is decoded and forwarded to the application program. Likewise, the application program can send data to or receive data from the serial port. The digital I/O features allow the software to control the relay outputs and query the counter inputs. The EP310 has two (2) emulation modes, the "Virtual Terminal Command" (VTC) mode and the "ANSI Emulation Mode". The VTC mode provides a unique but simple protocol that eliminates the need to know all the particulars of the lower level ANSI protocol. The ANSI emulation mode is a subset of the standard ANSI terminal protocol. For more information on these emulation modes see the "Software Interface" section. The EP310 connects to a 10BaseT or 100BaseT hub (or switch) via a standard RJ-45 Ethernet (CAT 5) cable. From a network perspective it occupies a single "socket" at a specified TCP/IP address and port number. The device must be configured with a unique IP address, net mask, and port number BEFORE it is installed on the network (see "Network Configuration"). The host software communicates with the EP310 by establishing a connection with the terminal and then sending and receiving ASCII text command strings (see "Software Interface"). In addition to the primary TCP/IP network port the EP310 supports an additional Telnet port (port 23). This port can be used by a Telnet client for remote configuration and control using the "Telnet Command Mode". An "Aux Command Mode" is also provided to allow initial and local configuration using the serial RS-232 port on the EP310. The "Telnet Command Mode" and the "Aux Command Mode" allow all of the VTC commands to be executed. The EP310 typically includes a bar-code or mag-stripe reader for operator input. Optional inputs include RFID or Wiegand card readers. In addition, bar-code wands or scanners can also interfaced to the decoder. Optional digital inputs with counters and software controlled relay outputs provide machine control interface for an external device. The barcode decoder input option allows one (1) or optionally two (2) bar-code input devices to be interfaced to the EP310 decoder. Decoded input is converted to an ASCII string and appended with an automatic "Enter" (<CR>) code. The EP310 will automatically discriminate and decode Code 39, Code 128, Interleave 2/5, Codabar, and UPC/EAN symbologies. Available input scanning devices include wands, slot readers, and wand emulating CCD or laser scanners. 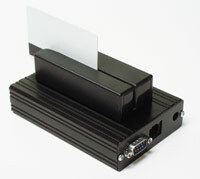 The mag-stripe decoder input option allows either a single or dual track magnetic card reader to be supported. Either single Track #1 or Track #2 reader can be decoded and the input is converted to an ASCII string and appended with an automatic "Enter" (<CR>) code. If a dual track reader is installed track #1 will be decoded first and if it fails track #2 will be decoded. The optional RFID proximity card reader configures the EP310 to read proximity cards. The serial RS-232 port is used to initially configure the EP310 via the "Aux Command Mode" which provides local communications with a terminal or laptop computer. The serial port can also be used to interface serial devices like scales, scanners, counters and other machines with the application software over the network. Input on the serial port is forwarded as an ASCII string to the application program. Software can direct output data to the serial port to support an attached device such as a serial strip printer. Access to the serial port is provided by a DB9M connector configured as a DTE device. The digital input option provides four (4) solid state relay (SSR) inputs which can be read under software control. In addition, each input will increment an eight (8) digit counter which can be read/cleared under software control. Activation voltage for each input must be between 5 - 24 Vdc or they can be optionally configured to support a "dry contact" input. The digital inputs are "debounced" and must be active for at least 20 milliseconds and inactive for at least 20 milliseconds. Therefor, to accurately increment the counter the maximum count frequency is 25 counts/second. The EP310 can be equipped with four (4) solid state relay (SSR) outputs that can be individually activated under software control. Relay controls include "On", "Off" and "Pulsed" for a specified amount of time. Each relay has a single "form A" contact rated at 10va (100vdc, 100ma.) maximum. If larger loads must be controlled use of an external relay is required. The relay outputs can be optionally configured to directly activate an external 12Vdc relay. For more information on external connections see application note AN0202. Optional Power Over Ethenet (PoE) is now available. The EP310 is powered by a 12Vdc power adapter that plugs directly into a 120vac receptacle. Typical power consumption is less than 6 watts. Attaching optional input devices (laser scanners, card readers, etc.) can increase the power consumption slightly. Alternate power supplies are available for international customers or the EP310 can be powered using a 12Vdc supply connected to the power jack. Software communications with the EP310 is simple and straight forward. The primary TCP/IP port is used for communications with the user application program. Normally, the host software (client) is responsible for establishing a network connection with the EP310 (server) on a specified port. Alternately, the EP310 can be configured to automatically establish a connection (client) with a host computer application (server) using the SERVER parameter (see "Setup & Configuration" section).